What do Marilyn Monroe and Sean O’Casey have in common? They never met and she never appeared in any productions of the playwright’s work. However, she was a fan. On a visit to England in 1956 with then husband Arthur Miller, she said the person she most wanted to meet was O’Casey and she had read the first volume of his autobiographies. But there is another unlikely connection between them – a Dublin shop. Cleo is a knitwear and handcrafts shop on Dublin’s Kildare Street, opened by Kitty Joyce in the 1930s, and now run by her daughter. It’s the subject of a book by Hilary O’Kelly (Cleo: Irish Clothes in a Wider World, Associated Editions). The book tells the story of the shop’s foundation and features photographs from the shop’s back catalogues of celebrity customers wearing its merchandise, including Marilyn Monroe and O’Casey. Having spent several years inhabiting the world of Sean O’Casey while writing The Rising of Bella Casey,I thought I was familiar with almost every facet of the playwright’s life. Except this one – Sean O’Casey as fashion icon! After O’Casey moved to London in 1926, he rarely returned to Ireland. He was stung by Yeats’s rejection of his WW1 play, The Silver Tassie, in 1928, a decision which deprived him of a natural repertory of actors to perform his work. It hardened his attitude towards Dublin and fastened his self-imposed exile in England. 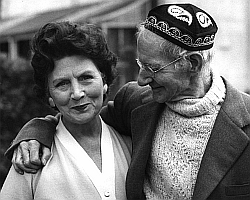 However he did visit Dublin at least once afterwards – he came on a holiday with his wife, Eileen, in 1935. Perhaps it was then he acquired the Aran jumper shown in the Cleo catalogue. Or perhaps it was later, sent to him as a gift or ordered by mail? The cap featured in the title of O’Casey’s last book, Under a Colored Cap,(1963), a collection of articles “merry and mournful with comments and a song” dedicated to his granddaughters, Alison and Oona. O’Casey’s daughter Shivaun used the same title for her film documentary of her father in 2005. Prev Fiction – the asylum for the insane?